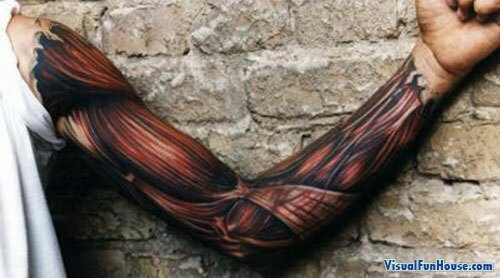 Muscle Tattoo Illusion creates a creepy effect as the muscles budge out of the riped skin. I cant say i would ever do something like that but its defiantly pretty neat.. and a bit strange to see! all he would need is a bit of fake blood and you would have an excellent Halloween costume! Be sure to check out some other Tattoo Optical Illusions. It’ll be even more disgusting in 30 years when he’s old and saggy. : And possibly fat.